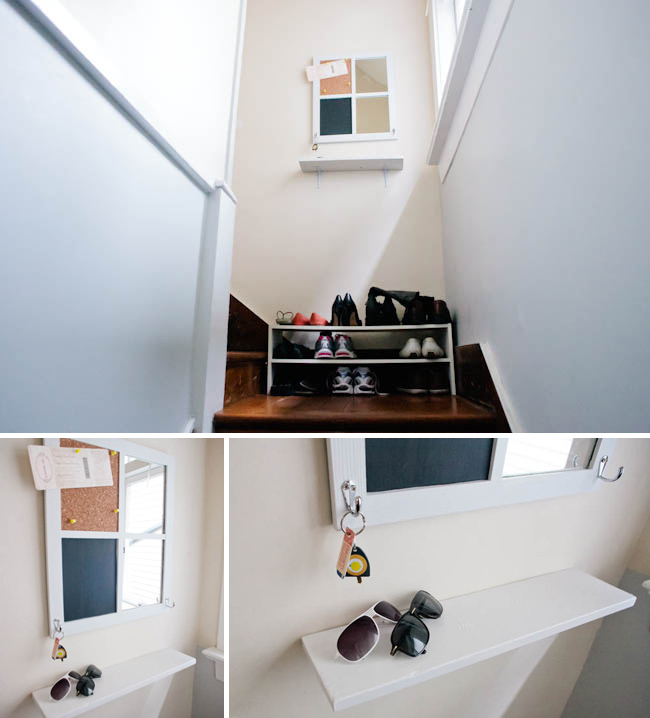 mini-project :: entryway | .liveit.loveit.blogit. The first part of my inspiration to add a little sumthin’ to our entryway had nothing to do with the entryway at all. Instead, it had everything to do with a little slice of counter in our kitchen that would get covered with mail, sunglasses, wallets, keys, and other entryway type things. This was beacause, as you can see, there wasn’t a lot of room in our landing for stuff. The second part of my inspiration came when I found this green mirror at the local thrift store for $4.99. I knew that I had a little shelf at home already, along with primer and glossy white spray paint. I just needed to buy some hooks! In trying to figure out the best way to pain the frame (for instance, should I first pop out the mirror) I actually broke the mirror—so I felt like a big dumb doorknob (origin of that expression: my mom). I also may have cursed a bit lot. 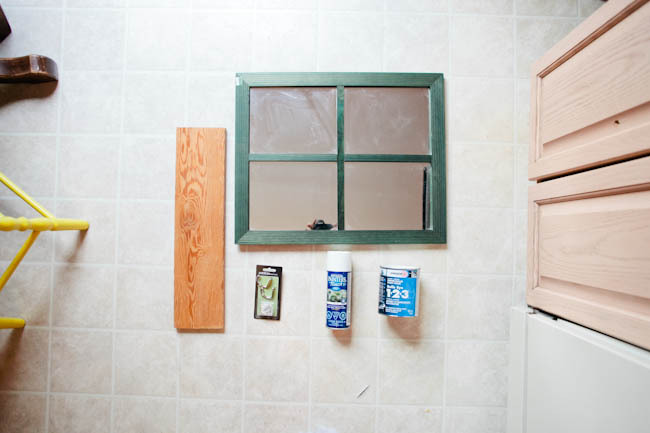 In the end, the breaking of the mirror ended up being a blessing in disguise since I decided I’d cover those broken bits with corkboard and chalkboard, making the mirror even more functional. Because of this I only covered half of the mirror for the painting part. I primed both the shelf and the mirror with three super thin coats of primer, the annoying green stain was still bleeding through a bit after the third coat. Yikes! Then I spray painted them with two thin and even coats of high gloss white. This whole process took a very long time. Why? You ask. Because it seems to only rain in Vancouver and waiting for nice outdoor days to paint and spray paint seems to take forever. I then cut a piece of particle board I had lying around and painted it with chalkboard paint (which I bought for another awesome yet to come project), and cut a piece of corkboard to size (side note, that stuff is surprisingly expensive). 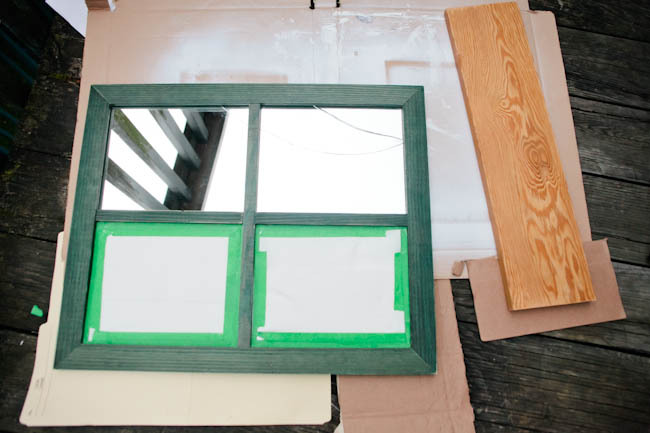 I glued them onto the broken mirror in the freshly painted frame. Then I screwed the hooks onto the mirror (for keys). Next, I installed both the shelf and the mirror… and presto: new (and much more functional) entryway! PS: No cute messages on the chalkboard because it needs 7 days to cure. PPS: I may have realized that the shoe stand was backward with the unfinished edge pointing out. This small detail just added to the final effect of my simple entryway makeover! Thanks Heather! It’s pretty cute and functional, so it makes me super happy. The fact that is clears up the kitchen counter is just an added bonus! Also: I spray paint for food! xo. but ican’t pin it ? That’s weird, it’s lets me pin. Are you using the pinterest bookmarklet? thansk for the reply allison! now i didn’t use any bookmarklet but normally blogs just have a “pin it” together with the other share buttons so i can click on it and hten lcick on any picture to pin it no? Your comment got me thinking, so I actually added a pin it button to my images—and I think it’s super cool :) So, thanks so much for the idea! !